Join Kelly Carlisler in the Laney Forum to discuss Food Access and Disparities Thursday, October 16, 12:00 – 12:50 p.m.
Kelly D. Carlisle, Founder and Executive Director of Acta Non Verba, is a veteran of the United States Navy and has been the recipient of many awards, including the Navy and Marine Corps Achievement Medal. She is an avid gardener and is an Alameda County Master Gardener Trainee. 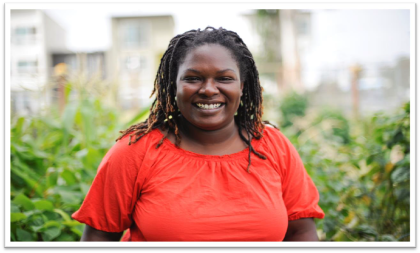 She is an active member of the Farmer Veteran Coalition. Ms. Carlisle was selected as one of 200 U.S. Delegates to Slow Food International’s Terra Madre and Salone del Gusto in 2012 and 2014. Ms. Carlisle is the December 2011 Bon Appetit Good Food Fellow. She has worked with and mentored pre-teen and teenage youth since the age of 14. A native of East Oakland, California, she is committed to creating positive change in her childhood city. Most recently, Kelly’s work has been honored at the White House by President Barack Obama.